$500 off your first months rent! Owner ready to rent now! Bring us your offer! A gorgeous Golf Villa on a premium lot within HWCC overlooking the 6th green of the championship style golf course designed by Arnold Palmer.The whole house is beautifully done w/ a large kitchen, maple shaker style cabinets, a prep island & breakfast nook. A stately brick exterior w/ professional landscape design along w/ a large paver patio with fire pit. 4 spacious bedrooms & a desirable open floor plan takes advantage of the gorgeous views w/ plenty of windows providing wonderful natural light. An elegant master suite with walk-in closet and large bath. Bright white trim, casing, 6 panel doors and crown molding. 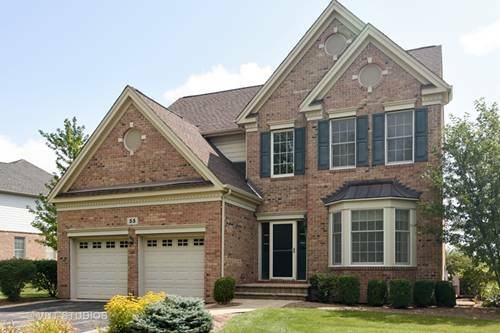 Hardwood flooring, 1st floor office, laundry, powder room & formal dining/living rooms. Huge finished basement with bar! For more information about 55 Open, Hawthorn Woods, IL 60047 contact Urban Real Estate.